Grade your new lawn as level as possible, avoiding any depressions where standing water might be a problem. Have the slopes incline gently to prevent washouts and to make later mowing easier. After the final raking, apply fertilizer. Use fertilizer high in the middle number (phosphorus). Phosphorus is necessary for strong root growth. Spread evenly at the rate specified on the label. Rake again before seeding. For home lawns use a quality grass seed mixture. The mix should contain Kentucky bluegrass, Fescue and 20‑30% turf-type Perennial Ryegrass. Ryegrass will aid in resisting certain fungus diseases. Apply your seed as evenly as possible. A spreader is almost essential for large areas. Take 1/2 of the seed and spread it over the entire area. Now, spread the remaining seed again over the same area, but in the opposite direction. Grass seed germinates best at a depth of one‑eighth to on‑quarter of an inch. So, rake again lightly. 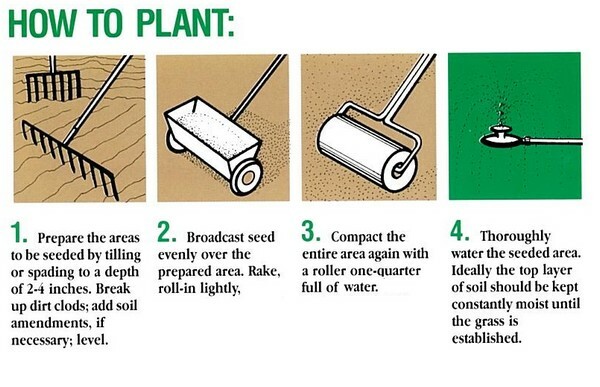 Then roll the seeded area with an empty roller or a roller with one-quarter full of water. The seed is now firmly pressed into the seed bed. Water now to a depth of about one inch, slowly so as not to form puddles or cause run off on any slopes. Keep the new seed bed wet until grass is growing over the entire area –about 2-3 weeks. After that, increase the amount of water applied, but decrease the frequency eventually to once or twice a week. Keep traffic off the tender seedlings. Mowing can begin when the grass is about 3 inches high. Overseeding or patching a lawn. Lower your mower blade to its lowest cutting height and catch clippings or remove them afterward. Rake vigorously to loosen the soil. Now is the time to level your lawn if necessary. Fill any depressions with good topsoil and remove any high spots. A light layer of topsoil, spread over areas where there is some grass and well raked in is helpful. Grass seed will grow better if it has good contact with the soil. Apply fertilizer, seed and water as outlined above. Seed germinates best when temperatures are 15-25 degrees Celsius. If the weather is cooler than that, the seed may take longer to germinate. The best time to seed is mid-August to late September. The next best is mid-April to late May. Summer seeding will give reasonable results if sufficient watering is applied.